Movie Review — Make Way, Make Way! ‘Moana’ is Calling You! You are at:Home»Arts/Entertainment»Movie Review — Make Way, Make Way! ‘Moana’ is Calling You! It is no secret that a multi-media conglomerate such as Disney can turn out successful films one after the other. However, there is something to be said for the development and progress the production company has made in its endless bounds towards a more inclusive and culturally rich repertoire. Moana, the latest installment in the Disney princess movie franchise (although that in itself is up for debate, as the film’s title character will object) is a credible marker in the strides Disney had made – from the gorgeous production design to the catchy tunes that will most likely be playing on repeat, the film reminds us of the wonderful capacity for storytelling and narrative design the production company possesses. This fun flick follows the story of its title-character, a young woman readying herself to be chief of the island village of Motunui, and her quest to save her people from a withering environment. On her journey, Moana meets the once-powerful demigod Maui; he has stolen the heart of Te Fiti, an island goddess, and must work with the soon-to-be-chief to restore it to its rightful place. 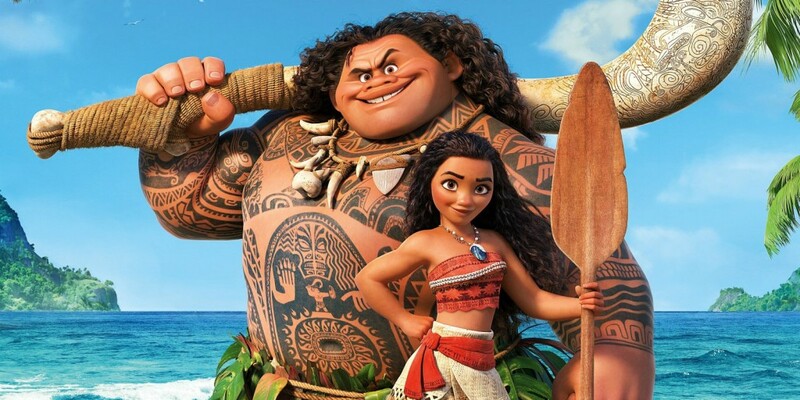 Part of the film’s unmistakable charm is the chemistry that forms between these two characters; the voice talents of Dwayne Johnson and Auli’I Cravalho help bring Maui and Moana to life in a way that truly breathes vitality and vibrancy into their characters. Their friendship is riddled with classic Disney quirks of its past dynamic-duos; the smug and arrogant Maui (Johnson) holds Moana (Cravalho) in contempt until she proves herself worthy. In the end, the heroine reveals something in both of them they were previously unaware of, which not only allows for Moana’s mission to be a success, but also for her to experience a flourish of new talents and an identity of which she can be proud. The perfectly in-beat resolution and symbolic relationship between the two main characters aren’t the only nods to a classic Disney narrative that make the film such a hit. Naturally, there is the animal-sidekick, jovial tunes sung along the way, a “dark night of the soul” moment where the heroine must decide to press on alone and an incredibly explosive action sequence when she does. The film arguably suffers from one-too-many drawn-out songs – it would be “Shiny” for me – yet it almost seems aware of this indiscretion and admits to it through a clever fourth-wall break (i.e. the crab monster asking, “Did you like the song?” as if that may be all there is to be taken away from the scene). What does set Moana apart from its predecessors, however, is that this time, the film has seemingly mastered Disney’s “princess”movie formula. The events transpire as expected, but they are hit with rigorously precise timing, amid a strikingly beautiful landscape where every drop of the ocean is met with insatiable clarity. One element that undeniably lends itself to this success is the way in which Disney derives its fairy-tales and draws on a cultural narrative to bolster it. The exposition of Moana’s roots in voyaging paint a beautiful map of where her people have been – and where they have the potential to go. It is also through her connection to Polynesian culture where one of the key themes in the film is exposed and it is one of a social commentary (something Disney has proven itself to triumph in, as with Zootopia). The catchy and insightful music of Lin-Manuel Miranda adds to this layer and we as an audience are encouraged to look within as Moana does to find ourselves, while consciously looking for the opportunity to understand others, as well. The film’s title character exhibits this trait eloquently, as much of her mission depends on her ability to understand and persuade Maui; a character who proves himself to be a map of emotions (as his canvas of tattoos reflect). Through this relationship and resolve, Moana reminds and encourages us to not ruminate and fester on the hurt and hostility humankind has the potential to cause one another (as Maui did when he stole the heart of Te Fiti); the overreaching effect only hinders progress. Instead, we should focus on loving and embracing each other at our most basic core and across our universal commonality – planet Earth. In this way, Disney sneaks in another element of social commentary beautifully – Te Fiti stands as a representation for the environment and it’s high-time she’s awarded some screen time, as well as her close-up. Given the current climate we seem to have captured ourselves in – one of divide and an voracious need to point out other’s wrongdoings – I would like to give our readers an assignment: Go see Moana, enjoy the catchy music (but not so much to a point where you forget its sub-textual meaning) and allow yourself to be taken in by the beauty of its scenery, narrative, and characters. Pay attention to the way in which Moana, a blossoming island-chief, never has her authority questioned for being female; instead the movie puts the power of agency into women’s hands without reservation. Recognize the ways in which relationships are formed across differences and through understanding. But above all, enjoy the film for its laughs, themes and “awwwww” moments and allow yourself to do so; Moana makes it possible.